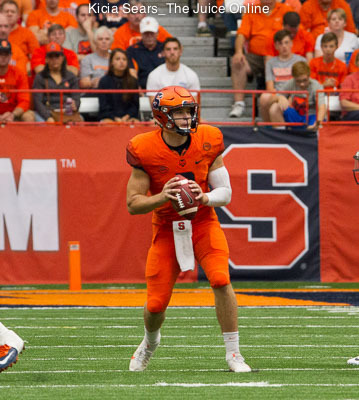 One week after his gritty, defiant performance gave Syracuse one of its greatest wins in program history, Eric Dungey gave another valiant effort in the second half. That effort was necessary due to Dungey throwing four first half interceptions, digging a giant hole that the Orange could not escape at #8 Miami. While SU rallied to within a single point, a late, back-breaking touchdown gave the Hurricanes (6-0, 4-0 ACC) a 27-19 victory. While the game was not over when Miami scored with 2:48 left on the clock, it reached the point of inevitability when Dungey’s fourth down pass to Erv Philips was incomplete 77 seconds later. The loss sends Syracuse to its bye week with a record of 4-4 overall and 2-2 in conference play. 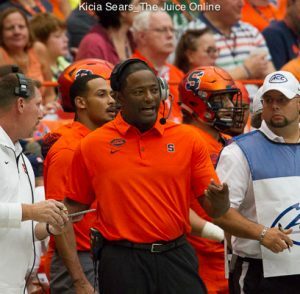 That break comes at an opportune time for the Orange, as some extra rest to refresh the team and hopefully get some injured players back could prove helpful for a November push toward a bowl berth. Eric Dungey did not wait long to show he was off. After incompletions on his first two passes, Dungey tossed his first pick of the night, but atoned for the mistake by yanking the ball back from the Miami defensive lineman who had made the interception. Two incompletions later, Syracuse was punting the ball away. 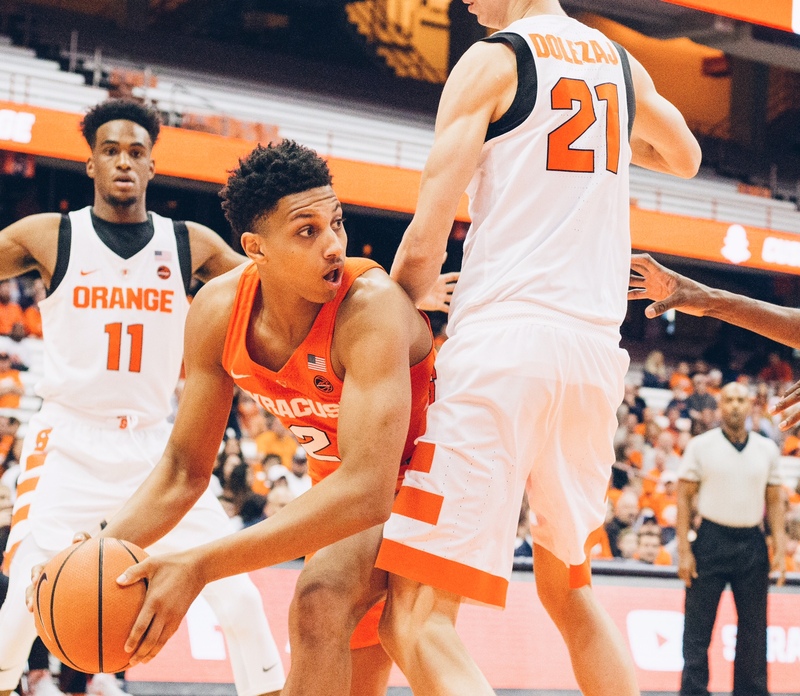 The Orange defense showed little in their first appearance until the Hurricanes were threatening to score. Backed up to their own three, the SU defense bowed up, holding Miami to a field goal and a 3-0 lead midway through the first. Dungey’s second interception can two drives later and it hurt, as it caused Syracuse to squander great field position inside the Miami 40. Eight plays after the turnover, Miami pushed their lead to 10-0 on a touchdown pass less than 40 seconds into the second quarter. The ensuing SU possession was another Dungey interception. This time, the Hurricanes were only able to capitalize with a field goal for a 13-0 lead. The Orange responded with their first sustained drive of the day. It almost ended early after a personal foul penalty on Ravian Pierce, but Dungey connected with Erv Philips for 27 yards on a third-and-25. Dontae Strickland added on a 20-yard run to get within field goal range and Cole Murphy would take advantage, booting a 22-yard field goal to cut the Miami lead to 13-3 with a little over six minutes left in the opening half. Dungey would tack on his fourth pick of the half to end the next drive, but it did not result in Miami points. The teams went to their locker rooms with the Hurricanes’ 13-3 lead intact. was a force on the drive, ripping off gains of 13 and 27 yards. Syracuse eventually drew within a single score when Murphy connected on a 40-yard field goal, his plant foot slipping as he made contact with the ball. The Orange trailed, 13-6, just over six minutes into the third. Six minutes later, a defensive breakdown by SU gave Miami a 48-yard touchdown pass. The extra point gave the hosts a 20-6 lead. With his arm being scattershot, Dungey shifted to his legs to help produce points on the next Syracuse drive. The quarterback raced for 28 yards to get into Hurricane territory, then added 14 more yards a couple plays later, capping that run with a hurdle attempt that ended up flattening a defender instead. On the next play, Moe Neal took a handoff left, turned the corner and bolted 15 yards untouched into the end zone. Murphy tacked on the extra point, bringing SU within 20-13 with just over a minute left in the third. The Orange defense got stops on the next two Hurricane possessions and the offense cashed in both times on field goals from Murphy. The first, which came with just under ten minutes left, was good from 45 yards and the second was a career-long 53-yarder that was true all the way. Murphy’s fourth field goal of the day clipped the Miami margin to 20-19 with 5:23 on the clock. The ‘Canes responded with their longest drive of the day, marching 85 yards in nine plays and reaching paydirt on a 33-yard touchdown run. The extra point was good, stretching their lead to 27-19 with 2:48 left. Dungey hit Devin C. Butler for 22 yards on the first play of the ensuing SU drive, but the offense petered out after that. A Dungey scramble a couple plays later would get them to the Syracuse 47, but a sack and an incompletion ended the last Orange hope. Dontae Strickland had his best effort of the season, rolling up 105 yards on 14 carries. While he had a subpar game passing the ball (13-of-41 for 137 yards and four interceptions), Eric Dungey joined Strickland in triple digits on the ground, amassing 100 yards on 20 rushes. Erv Philips led all SU receivers with five catches for 57 yards. The leading Syracuse tackler for the fifth straight contest, Parris Bennett reached double figures in stops for the fourth time in five games with ten tackles. The Orange will return to action on Saturday, November 4 when they have their second straight trip to the Sunshine State, this time visiting Tallahassee to take on Florida State. The Seminoles, who entered the season ranked #3 in the nation, have sputtered after losing starting quarterback Deondre Francois in their season opener, and stand 2-4 overall and 2-3 in conference play. FSU had a pair of games affected by both Hurricane Harvey and Hurricane Irma, the former cancelling a game with Louisiana-Monroe and the latter forcing a postponement of their contest with Miami. As a result, the ‘Noles will be playing their seventh consecutive week when they match up with a Syracuse. Florida State will play at Boston College on Friday night while SU is on their bye. Game time and television network for the Syracuse-Florida State game are to be determined at this time.